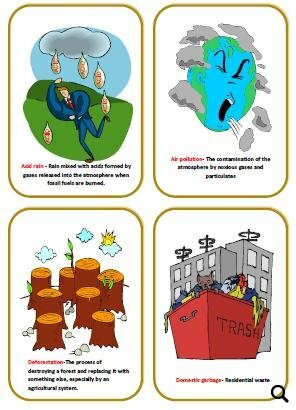 This is set of cards to get your students talking about the ENVIRONMENT. Each card contains a word and its definition; they are also illustrated with pictures. 1. You can use the cards in pair work. Each student picks a card, look at the picture and reads out the definitions. If the other student can give the word in red, he/she gets the card. If he/she doesn’t know the word, the other student keeps it. The one who has more cards in the end is the winner. 2. You can use them for speaking. 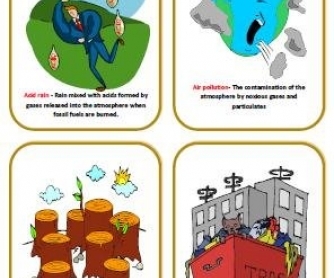 Each student gets 1 card and he/she must use them in a short talk about the environment. 3. A group of students gets 2 cards and they must speak about environmental issues but they mustn’t use any of the words that are on their cards.